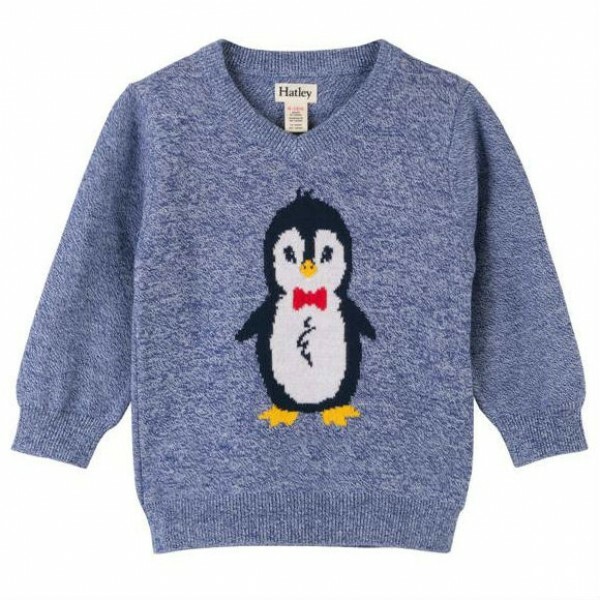 A sweet addition to their everyday edit, this Blue Penguin V-Neck Sweatshirt from Hatley is a fail safe buy - undoubtedly one of the highlights of the Autumn/Winter collection. Crafted from a pure cotton, the breathable, comfortable design includes a V-neckline, an adorable penguin print to the front and banded cuffs and hem. Pair with chinos or jeans for a stylish outfit that will be your young man's favourite choice all season long. We love how cosy this jumper is- your little man is guaranteed to stay warm all winter long! The stunning blue colour is a great tone for the Autumn and Winter seasons. An exceptionally well made and durable piece that he'll love wearing for a long time to come!